Scoreboards, Backlit and Outdoor Electronic Media Displays | Outdoor Specialist, Inc.
Digital Message and Scoreboards By Outdoor Specialist, Inc. Outdoor Specialist, Inc. does more than just build state-of-the-art outdoor advertising structures such as billboards and sign poles. We build scoreboards! Our professional Sales and Engineering staff works with the vendor you choose for scoreboards, electronic message, and back lit displays. When OSI is involved from the beginning, you are assured of getting the best value and function from your structure. Let Outdoor Specialist, Inc. be your first choice. We team with you and your electronic display manufacturer until the project’s completion. As with billboards and sign poles, we can work with you nationwide. Working projects from concept to installation, assures your outdoor display fits your needs within your budget and delivered on-time. Best Practices demands a thorough on-site consultation. Let us visualize the final product to get it right the first time! Outdoor Specialist. Inc. is committed to backing up quality with performance. 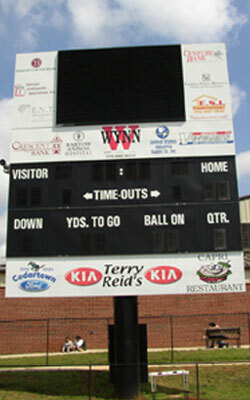 From community sports facility complexes, to major college and professional stadiums, Outdoor Specialist, Inc. is the best choice for scoreboards and electronic message displays! “I have almost exclusively used Outdoor Specialist, Inc. in developing our plant. With confidence we face the challenging Midwest weather knowing we have the highest quality engineered and fabricated advertising structures on the market. Our employees can safely and efficiently change advertising copy on OSI-built structures. Over the previous 20 years I have seen many examples of billboard plants built with inferior materials and fabricators. In simple terms, saving a couple of bucks on an asset that will be in place for the next 30 years is not worth the peace of mind you recieve in having a top quality OSI structure in your billboard inventory!